One of our favorite things about what we do is seeing all the unique, creative, and beautiful locations and styles of our brides' weddings, and seeing how each bride's dress fits into her individual wedding vision. We may be a bit biased, but we think our brides have the absolute best taste! Little White Dress bride Jill is no exception. Jill and her husband Bryce got married in a beautiful, traditional church ceremony, and then celebrated with a reception at one of the loveliest barn venues in Colorado, the Chatfield Botanic Gardens. The result is a sweetly timeless wedding, with soft mint and gold accents, a cake made by Jill's mother, and of course our favorite detail - Jill's eyelash lace Robert Bullock Bride gown. 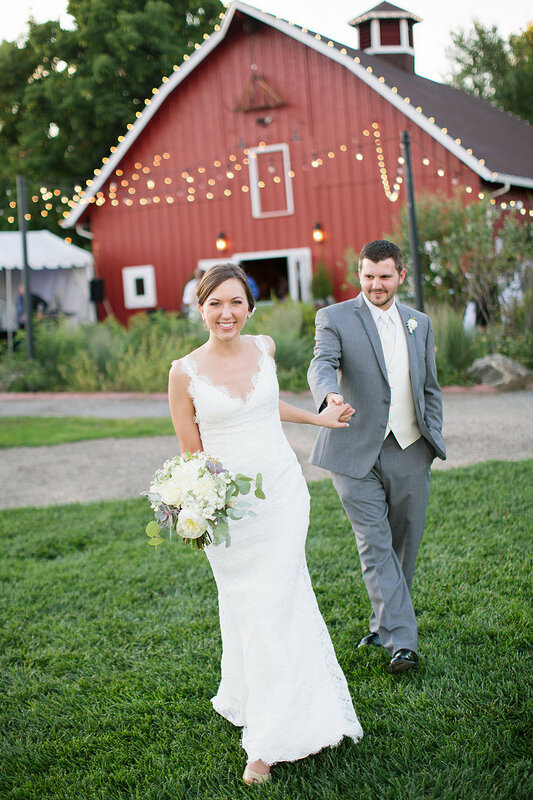 The fact that her dress looks perfect at both a church ceremony and a barn reception is a testament to the gown's beauty - and versatility. Congratulations to Jill and Bryce! Many thanks to their photographer, Jackie Cooper Photo, for sharing their big day with us!